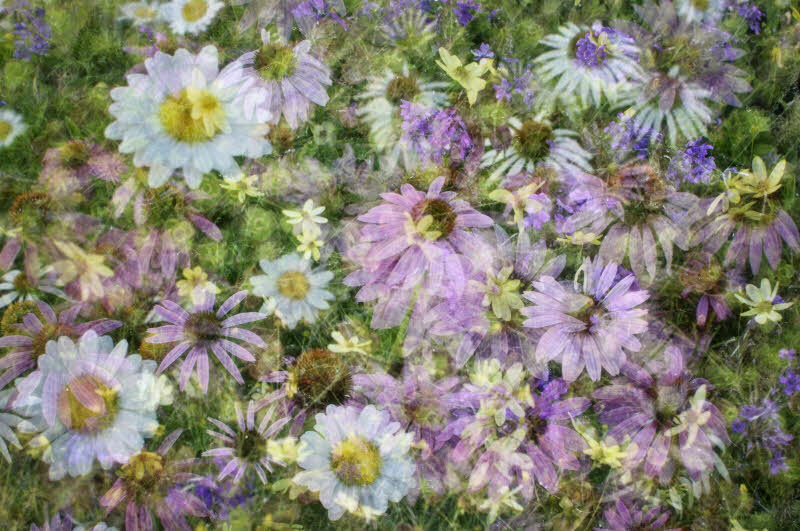 This is a six-shot multiple exposure done entirely in camera (you’ll need Photoshop, or a film camera, if you don’t shoot Nikon). This technique is a work in progress as noted in yesterday’s post. identical exposure for each shot. The “rule of thumb” calls for six exposures to be made at somewhere between -2 and -3 EV. Since I was doing two exposures at less than 2, I took the remaining 4 at the high end of that range. It’s not critical to be precise if you shoot in RAW where minor exposure adjustments can be made in post-process. Why use one exposure setting for some exposures and another for others? I wanted some things to stand out from the rest. I reasoned that this could be done by “overexposing the special frames relative to the others”. In today’s image I did just that by shooting the same flowers twice (within my ability to handhold steadily) at an exposure one stop greater than the background (which were intentionally shot from four different locations to ensure variety and randomness). It took a bit of trial and error to arrive at this approach – and there’s more to be done. 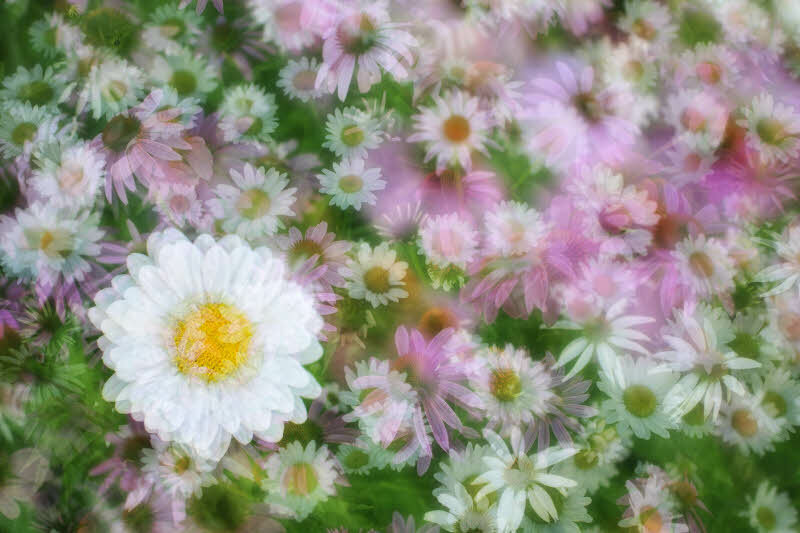 Shooting all frames at an identical exposure will result in all flowers receiving the same emphasis – except for their relative size and color. Yesterday’s image relied on size/color by moving in much closer for one of the five exposures and using white flowers that stood out from the crowd. Note that the white daisies in yesterday’s do not stand out from the crowd as much as in today’s approach. 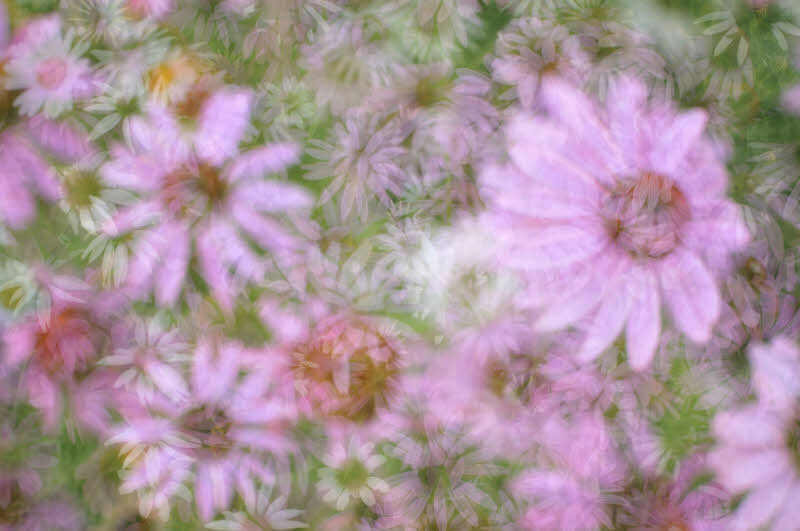 A second example of using different exposure settings (four exposures at EV=-2.66 and two, for the larger flowers, at -1.66 to make them brighter and more pronounced). Lots more to learn here…….. This entry was posted in Composition, Craftsmanship, Exposure, How did you make that image?, Post-Processing and tagged Art Photography, Color Efex Pro, Image Editing, Multiple Exposures, Nik Software, NX2, Outdoor Photography, Photography, Photography Composition, Photography How To, Photography Technique, Photography Tips, Photography Tutorial, Photoshop, Post processing by Ed Knepley. Bookmark the permalink.